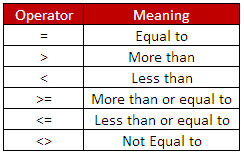 This tutorial guides you through the basics of conditional and logical operators and shows you how to use IF THEN ELSE statement in excel VBA. If student's grade is greater than or equal to 60, he/she will be considered as having passed the examination. The If statement checks the condition "score >= 60"
The "score >= 60" condition will return either TRUE or FALSE. If the "score >= 60" condition evaluates to TRUE then examresult function will return PASS. End if is necessary to complete an If statement. If student's grade is greater than or equal to 60, he/she will be considered as having passed the examination. Else he/she will be considered as having failed the examination. If student's score is greater than or equal to 75, he/she will get A grade. If student's score is less than 75 but greater than 50, he/she will get B grade. If student's score is less than or equal to 50, he/she will get C grade. 0 Response to "Excel VBA : IF THEN ELSE STATEMENT"